I decided that today I'm going to stay inside allll day and play secretary for my husband and get lots of important things done like bank accounts and filing. Which is why I'm writing a blog post obviously. Fortunately I am able to stay home and have hermit days like this, and you can bet your bottom dollar there will be no maternity-jeans or bra-wearing on said days. Because those clothing items are my nemesis right now and I think I have lost all my dignity. Unfortunately this means I probably won't be answering the door if any random surprise packages should turn up by courier. Fortunately I'm not expecting anything. Which is actually unfortunate because… packages! Fortunately I haven't spewed in quite some weeks! Unfortunately the last occasion is etched on mine and everyone else in the restaurant's memory forever. Fortunately I nearly made it to the bathrooms! Unfortunately I neeeeeaaarrrly made it to the bathrooms. Fortunately I didn't have to clean it up. Unfortunately the poor waiter did. Fortunately I didn't fall on my face in it. Unfortunately I did slip (but backwards) into my husband. So…. fortunately…. ur…. can't think of a fortunately to round this one off. Fortunately I got the best pregnancy jeans ever from Jeans West. Unfortunately I have developed a phobia of getting dressed. 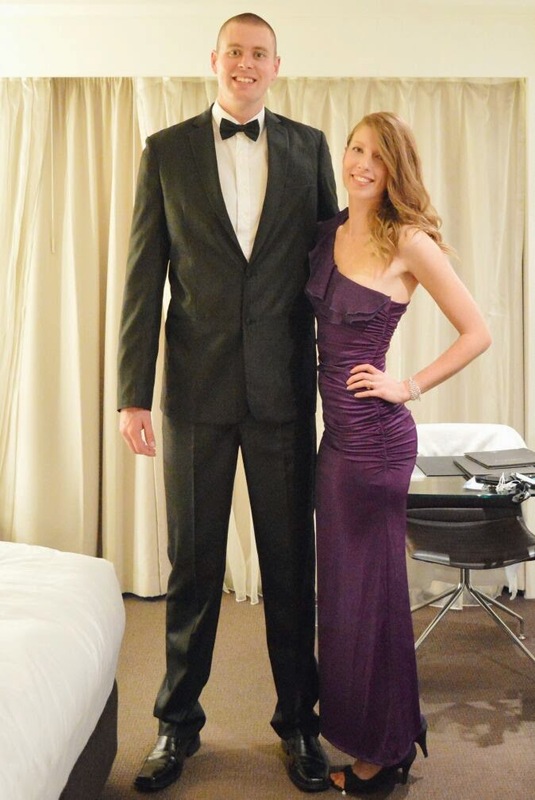 Fortunately I was able to fly to Auckland for a fancy shmancy black-tie event with my husband! (Above). Unfortunately I got a heinous haircut 2 days earlier. Fortunately I managed to re-cut and style it myself in the privacy of my bathroom and vow to never trust a hairdresser again. Unfortunately I ugly-cried on my husband when he came home because "it was the only thing left that still made me feel prettttyyyyyyyyyy"
Fortunately it's kind of liberating to just say goodbye to your dignity. I'm 9 months pregnant with hair I don't like, bloaty thighs and an aversion to clothing. Hi. Fortunately I have had a ball reading some mommy-blogs particularly this one because of the hilarious stuff her kid says that makes me laugh until my abs hurt. Kidding - I don't have abs anymore. (Unfortunately). Fortunately our baby is due is about a WEEK! Unfortunately I'm slightly panicky over this. Fortunately I will get to hold it and be in awe of the amazingness. Unfortunately I have to push it out my ladyparts first. Fortunately we have most of our nursery set up. Unfortunately I am SUCKING at decor right now. I think I'm just going to leave that room a blank slate because the green-blue carpet and orange-pine doors that I always complain about actually frustrate me enough to effect my mental health. Fortunately I can sleep in almost every day before baby comes. Unfortunately I am getting up up to 6 times a night for milk-feasts and pitstops. Mmm. Milk. Fortunately I don't have any weird cravings. Unfortunately I lied. The smell of dirt and bark make my mouth water. Also… chemical bleach. Fortunately I haven't eaten either of those things. Unfortunately the smell of any cleaner (or cologne, shampoo, toothpaste) other than bleach makes me sick. Fortunately we haven't stopped using them. Fortunately we saw our baby's face on a recent scan and it was the cutest squished-up frowny face ever. Fortunately my husband is the best man in the universe. Fortunately we've had tonnes of quality time and spontaneous dates before the baby comes. Fortunately our house is so darn cosy. Fortunately the second half of this pregnancy is soooo much better than the first, for me. Fortunately we have family close by and wonderful friends who will help when we need it. Fortunately our baby is healthy.